Similar to a honeymoon gift fund, except I’m not getting married. I’m thru-hiking the PCT! 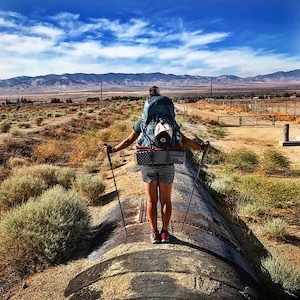 It’s a fun way for generous folks who find joy and inspiration in what I do and want to be an active part of my hike without having to take a single step to be a part of my PCT thru-hiking experience. The trip registry gives you an opportunity to gift me trail necessities like root beers, showers, loads of laundry, meals, hotel stays, campground stays, town resupplies, specific stops along my way to Canada, one of the four resupply boxes I’ll send to myself on trail, a specific Nero or Zero Day and even part or all of the side trip we plan on taking this year to Vegas/the Grand Canyon while waiting out the late season storms in the Sierra. Anyone who sponsors any part of my registry (no matter how big or small) will receive a handwritten postcard sent from me, from the trail so be sure to leave me your address when you send your gift. Patreon is an online platform where my biggest fans can support what I do, either on or off the trail. Fans, otherwise known as “Patrons” can pledge as little as $1/month and earn rewards based on the level of support they choose. Some rewards include access to LIVE monthly Q&As and exclusive videos of my hikes I don’t post anywhere else online. When you click on my Amazon Affiliate link and place an order, a small portion from your order will go towards my blog at no additional cost to you.